Sakari Gear is a small company based out of New York City. The owners traveled the world and tried many different brands of gear and decided to make their own gear with the items and features that they couldn’t find in other gear. Social responsibility is vital with all companies, and Sakari Gear is no different. They noticed that many girls did not receive the same educational opportunities as boys, so they have committed to donating 4% of their profits to help girls receive secondary education. I googled Sakari, and Urban Dictionary defines it this way “A beautiful girl who is smart, kind and hilarious. She is also sassy and makes the right decisions.” Not sure if that was the intent of the company but it seems to fit. Their first outdoor product is the Sisu sleeping bag. Sakari Gear describes the Sisu as a “high quality 3 season, 30F envelope style sleeping bag.” The Sisu features a polyester ripstop shell, polyester pongee lining, and synthetic hollow fiber fill. The bag is a rectangular shape with a drawstring hood, neck baffle and draft tube. It also features a pocket inside of the bag to store valuables and a two way zipper that allows the bag to be completely unzipped to use as a blanket. 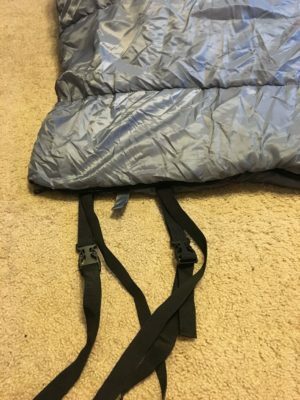 There are attached sleeping bag straps with buckles to hold the bag in a rolled up position. It also comes with a compression sack and a carabiner for easy storage. My first impressions of the Sisu are positive. I like the way that the inside of the bag feels. It is soft and comfortable. There appears to be plenty of room to stretch out with the rectangular shape. 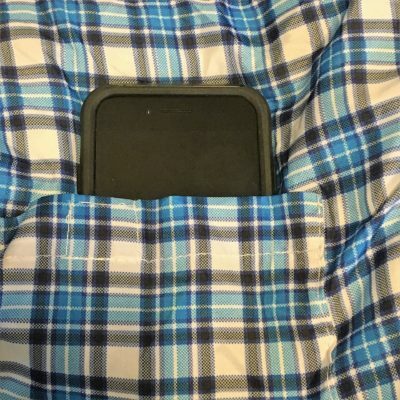 The inner pocket is large enough to hold my iPhone 6s and easily Velcro closed. The attached straps and buckles at the bottom mean that I won’t loose them. I don’t generally roll up my sleeping bags though, because I prefer to stuff them. The Sisu will stuff into the enclosed compression sack and can be compressed down. The Sisu is heavy, it is listed at 4.85 pounds without the compression sack and 5.1 pounds with. I weighed it with my scale and found that my measurements agreed with the company’s. I weighed the bag alone at around 4.5 pounds and 5.2 pounds with the compression sack. It is generally heavier than most of the bags that I use, but I will use it backpacking in addition to car camping. I generally evaluate sleeping bags on the following characteristics – comfort, functionality and durability. One of the most important factors for me is the temperature rating – does it actually keep me warm to the rating? For functionality – are there multiple uses for the bag? Can I vent the bag to use it at temperatures warmer than the rating? Durability – how does the bag stand up to use? Does the fill keep the bag lofted or does it flatten with use? These are just a few questions I hope to answer as I review the bag. I used the Sisu Sleeping Bag throughout the summer, fall and early winter car and cabin camping and while backpacking. It was used for 2 nights in a cabin at Bayou Segnette in Marrero, LA; car camping at Bogue Chitto State Park in LA; 2 nights backpacking at the Walls of Jericho on the Alabama/Tennessee line; multiple nights car camping at Buccaneer State Park on the Mississippi Gulf Coast; camping on a family farm in Mississippi during a youth group camping trip; multiple trips backpacking in the Black Creek Wilderness in Mississippi; and on a car camping trip at ClarkCo State Park in north Mississippi. Temperatures have been all over the place – it was in the upper 80s at the Walls of Jericho and the mid-30s my last night at Buccaneer State Park on January 19th. I have used the bag on warm and humid days and while it was raining cats and dogs as a typical winter cold front pushed through the south. I feel like I have used the bag in enough varied conditions that I can share my evaluation in confidence. As I mentioned in my introduction, there are three main characteristics that I use to evaluate sleeping bags – comfort, functionality and durability. After 13 nights of use, I can say that the Susi sleeping bag is very comfortable. It is a larger cut so there is plenty of room to stretch out in the bag. I never felt confined at all and could easily sleep on my side or flat on my back. The inner lining felt good against my skin, as I usually sleep in just a pair of shorts. The only thing I did not like about the bag with regards to comfort was the hood. It was too large and I just couldn’t get it cinched down to where it felt right to me. I compensated for this by wearing a beanie or a Buff when it was cold. 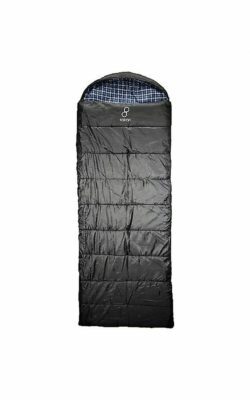 The second factor I looked at with the Sisu sleeping bag was functionality. I wanted to know if the 30 degree temperature rating was realistic for a $70 dollar sleeping bag. I spent multiple nights in the sleeping bag with temperatures ranging from the low to high 30’s, and surprisingly I was warm and toasty with no issues. I am really impressed that the bag worked so well. I honestly did not expect that it would keep me warm at the stated temperature rating. I will note that I ate plenty of calories to make sure my body could create heat, which is necessary with any sleeping bag. I also used a Therm-a-Rest Neo Air sleeping pad, which also played an important role in overall warmth. The Sisu sleeping bag performed well in cold weather, but what about hot weather? The bag also did well there. I liked that I could completely unzip the bag and use it as a blanket or just lay on top of it when it was hot and humid like the nights spent at the Walls of Jericho in Alabama. Although the included stuff sack does compress the bag some, it is still quite large. I found that I could carry it outside of my backpack because it would not fit in the sleeping bag compartment, even compressed. The second way I carried it in my backpack was to remove the divider so I had one large compartment and just shove the sleeping bag in first by itself, not compressed. Then I just put all my other gear on top of it and compressed it that way. This was my preferred method. Even so the sleeping bag is very large and heavy for backpacking. It would not be my first choice because of these reasons. However, it is perfect for car camping where weight and size don’t matter. The final characteristic that I evaluated the Sisu sleeping bag on was durability. This is a second area where I was skeptical on how the bargain priced bag would hold up. Like the temperature rating, I am impressed with how well the bag has stood up to abuse. I have purposefully been hard on the bag, leaving it compressed, just tossing it in the gear room when I returned from trips, and it has taken all my abuse and still looks new. I wondered with the polyester pongee lining would retain loft if it was compressed or damp. Compression did not seem to make any difference, because the bag didn’t really compress. Even so it held its loft whether it was in the stuff sack or kept in a large laundry style bag. On my last trip to Bucaneer State Park in January it rained and was damp and cold the entire time. My tent has a small drip and the bottom of the bag rubbed against the sidewall of the tent. There was no noticeable loss in loft and I actually did not feel any wetness penetrate through the bag. I did not have any durability issues with any of the other parts of the bag. The zipper zips smoothly most of the time. It did snag some but if I pulled the zipper by the body of the zipper instead of the pull tab I found it would not snag. The attached straps to roll the bag up do not show any wear, but I found that I did not really use them. It is a neat idea but not practical in my opinion and could save some weight. Overall, I am impressed with the Sisu bag from Sakari Gear. It is a bargain bag that performs like a much more expensive bag. I think it is a perfect bag for Scouts or the family getting into car camping. I will continue to use it on my car camping adventures. Thanks to 4alloutdoors.org and Sakari Gear for providing the gear for this review.